These “screme” eggs are new and Cadbury must be very excited about them, because they already made a facebook fan page! These eggs are just like the ones Cadbury releases every Spring for Easter. In case you have never had one, these are hollow milk chocolate filled with a creamy fondant center wrapped in silver foil. What makes these different from the Easter variety? 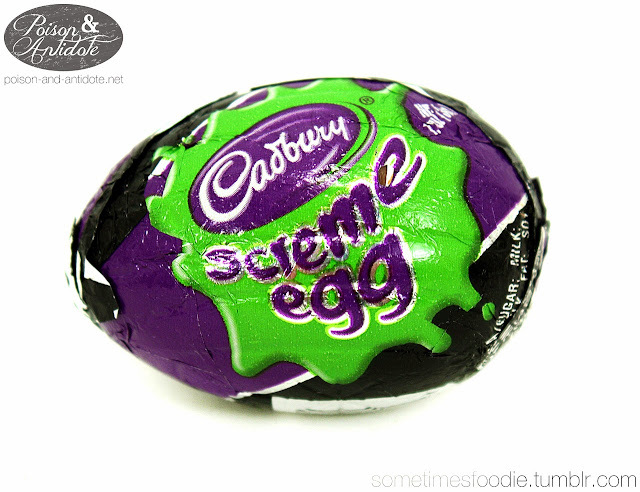 The filling is green instead of the traditional yellow-orange yolk color, and the wrapper has a spooky color palette of green and purple. Being a 90’s kid, it is hard for me to see green and purple together without thinking of Barney the dinosaur, but these specific colors don’t give me that feeling. The wrapper comes off very easily, which is good for unwrapping candy fast, but bad for cleanliness and display. 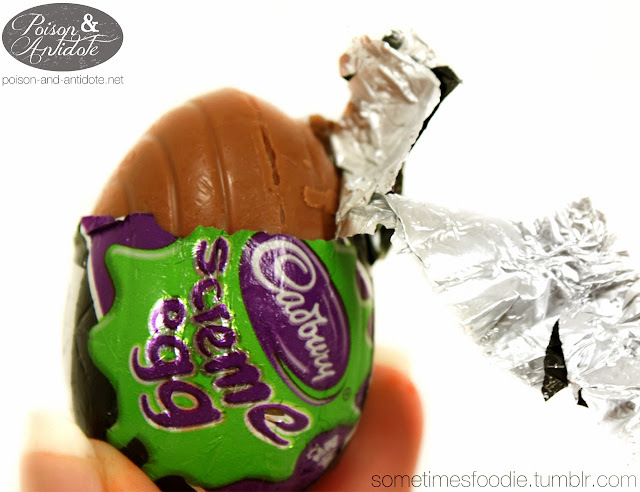 Some of the eggs get squished in the store and make a mess, others had the foil rubbed/peeled off so that the chocolate was exposed. I am not okay with eating candy everyone has touched. Peeling back the foil you can already smell the super sweet Cadbury chocolate, their milk chocolate has a distinct taste and aroma. 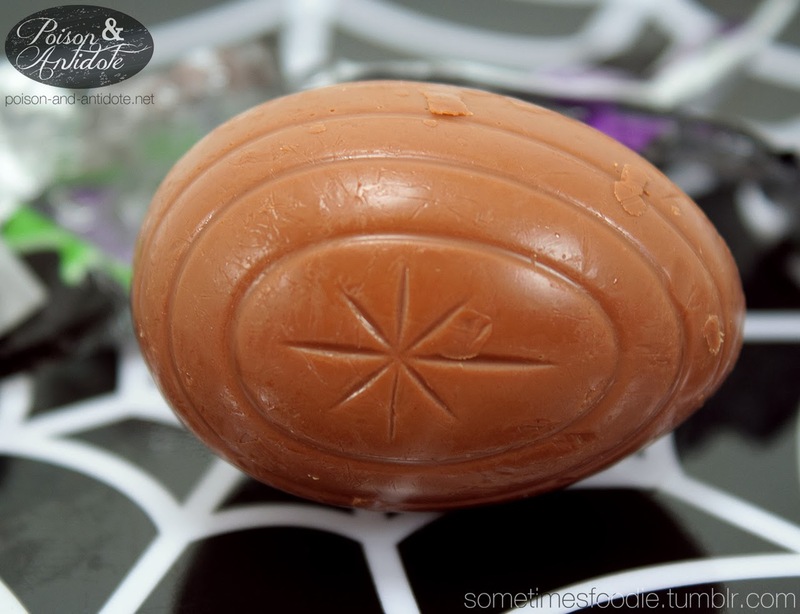 The egg itself has the same classic outer markings as the Easter variety. I have to say, this egg tastes the same as the Easter version. The chocolate is very milky and sweet, much sweeter than a Hershey’s bar, and melts on your tongue. The creme (or screme) filling is a liquid-y fondant that tastes VERY sweet, a little buttery, and has strong vanilla notes. 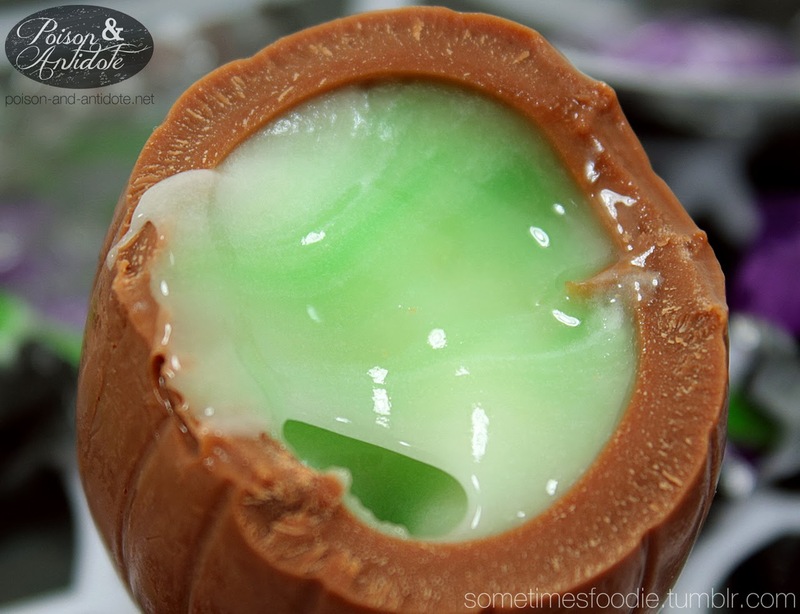 If you love these eggs, now you don’t have to wait for Easter to get your fix! Personally I want a dark chocolate version that is a little less sweet on the outside, I think that would be a fun difference for Halloween eggs. Dark chocolate AND green filling.